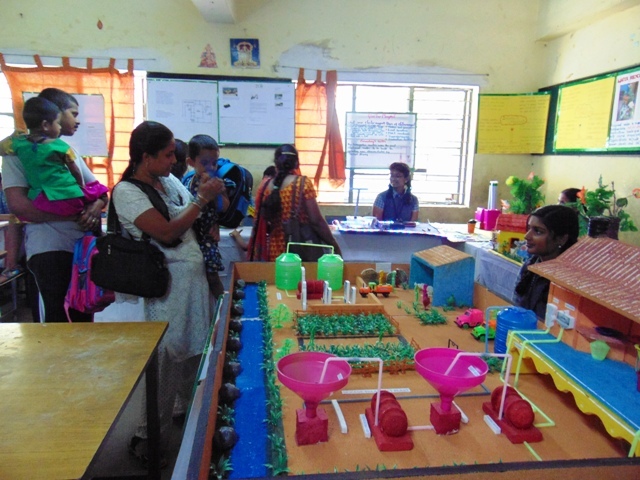 Vigyana Pradarshini - Science and Maths Exhibition (Vibagh Level) was conducted on 22.06.2018 in our school premises. Smt. 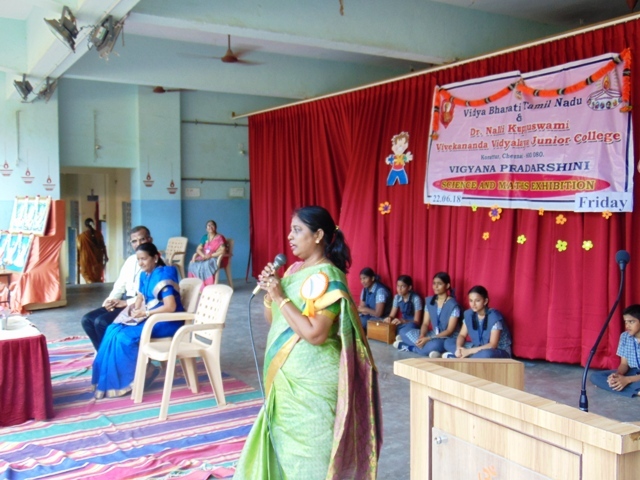 N. Vijayalakshmi, Principal of Bhaktavatsalam Vidhyashram, Korattur was the Chief guest. 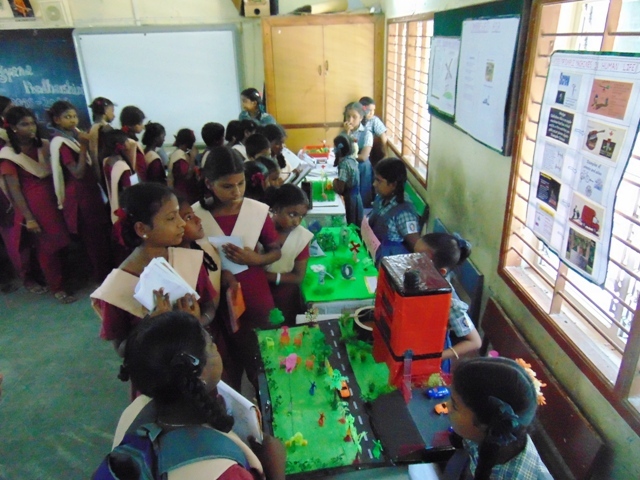 The neighbouring schools were invited to witness the exhibition. From Ambattur Township school 160 students and 4 staff visited. From Bhaktavatsalam Vidhyashram 230 students and 6 staff and 575 parents of our school visited the exhibition. 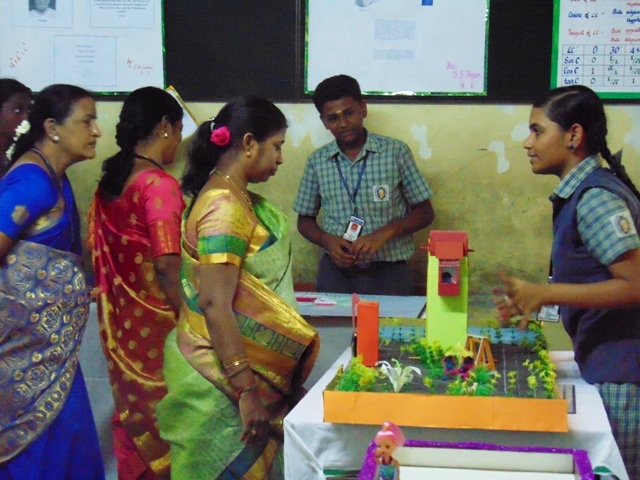 The preliminary round competition for Science and Maths exhibit, Experiments, Innovative model, paper presentation and quiz was held. “Education is the most powerful weapon which you can use to change the world” says Swami Vivekananda. 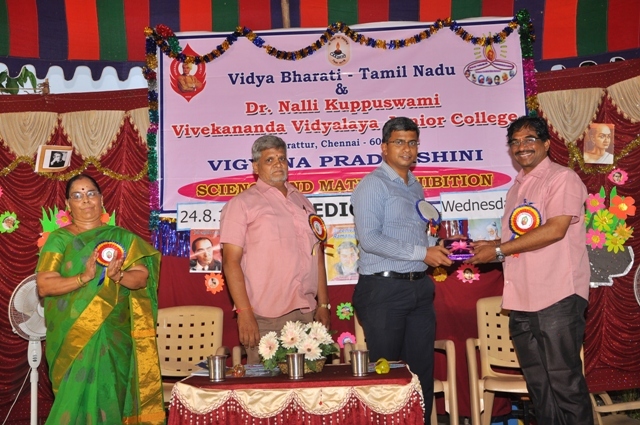 Vidya Bharati and VES have been organizing “Vigyana Pradharshini” Science and Maths exhibition for the past 6 years to bring out the scientific skill and analytical thinking of our Vidyalaya students. It is usually conducted at 4 levels – School level, Zonal level, State level and National level and for students of class IV to XII under 4 categories Sishu, Bala, Kishore and Tarun. 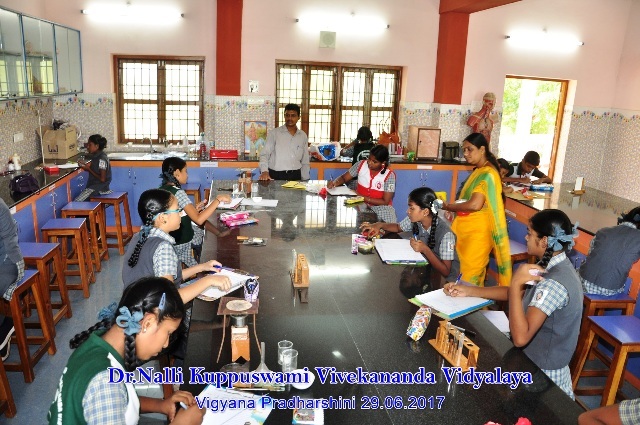 “Vigyana Pradharshini” at our school was conducted on 2 days – 29.06.2017 (Thursday) and 07.07.2017 (Friday). The following events were held on 29.06.2017 at our school. 47 students of our Child schools (Both Panjetty (46) and Pazhaverkadu (1)) who has won 1st position in their schools joined us as competitors in the various events. The Judges of the competitions - 5 of our Alumni joined us to conduct the Quiz programme with the judges and our SMDC member Sri. S.D. Mohanji also helped us in Culture paper presentation. We had invited 18 Judges from Bhakthavatsalam Vidyashram, Bharati Women’s College & Jaya Polytechnic. 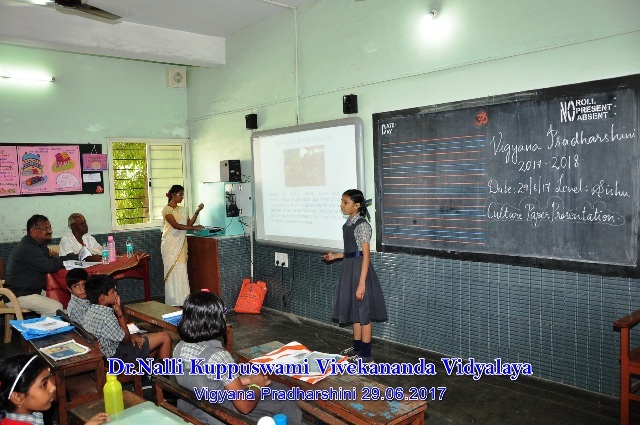 Science, Maths and Computer Science exhibits along with Teacher paper presentation and Exhibition of outside schools were held on 07.07.2017 at our Vidyalaya. The Inaugural Ceremony started at 09.00 a.m. in the august presence of the Chief guests Dr. G. Rani- Retd. Principal of SDNB Vaishnav College for Women, Chromepet and Dr. S. Ramya M.B.B.S. Alumni of our Vidyalaya. We had displayed 188 science exhibits (65 Shishu, 68 Bala, 34 Kishore and 21 Tarun) in 18 rooms, 78 maths exhibits (29 Shishu 19 Bala, 16 Kishore & 14 Tarun) in 11 rooms 32 computer science exhibits (19 bala and 13 Kishore) in 4 rooms. 52 first prize winners of our child schools also gave a tough fight with the mother school. Atmost 1200+150 men, women and children in and around our locality including visiting schools witnessed the exhibition and encouraged our children. The Valedictory function was held at 03.00 p.m. in the gracious presence of Dr.S. Gunasekaran, St.Peter’s University, Chennai & Mr. V.K. Mohanarengan, Proprietor APNA Engineers, Korattur distributed the prizes in the function. The programme was concluded with Santhi Manthram. 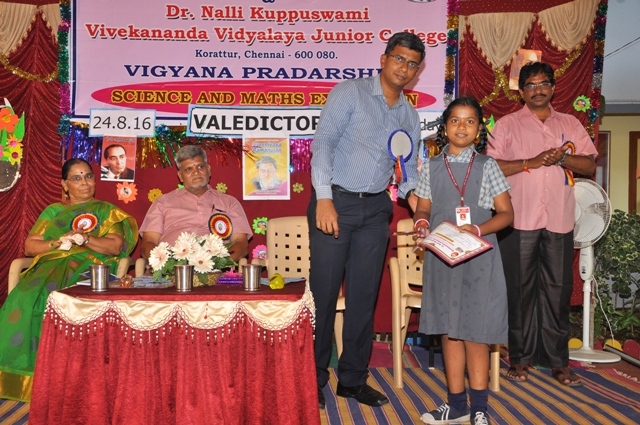 Dr. Nalli Kuppuswami Vivekananda Vidhyalaya Junior College joined hands with Vidhya Bharathi in organizing interschool science & Maths Exhibition at the school premises on 24th August 2016, Wednesday. Aim and Objective of this exhibition is not only to explore and encourage, scientific talent among our students but also to develop awareness about our glorious cultural heritage of the subjects like Sanskrit, Vedic Ganit & Science. 100% participation in all the four levels in all the competitions by our students was laudable. Publicity of this exhibition was made through Banners, Posters and Hand-Bills. Preliminary round (Selection round) was conducted on 10th August 2016. Quiz participants had written test for their preliminary level. Participants of paper presentation had their final competition on 18th June 2016. Vigyana Pradarshini was inaugurated on 24th August morning at 9:00AM. Shri. Mohanji, SMDC member presided over the function. The programme started in a traditional way with lighting of Kuthu Vilakku. Then we invoked the blessings of God almighty with a prayer. The logo of Vigyana Pradarshini was unveiled by Shri. Mohanji, SMDC member. Then he rendered presidential address. The exhibits were inaugurated by Shri. Mohanji, Our madam principal Smt. N.Kalaimani accompanied them to the respective rooms. Neighbouring schools like Sindhiya Model Hr. Sec School, Bhakthavatsalam Vidhyashram, Township School & Padma Sarangapani schools also participated in the competition at four levels and they won prizes. Students other than participants, Sindhiya Model, Bhakthavatsalam Vidhyashram, & Township School at Korattur visited and witnessed the exhibition. 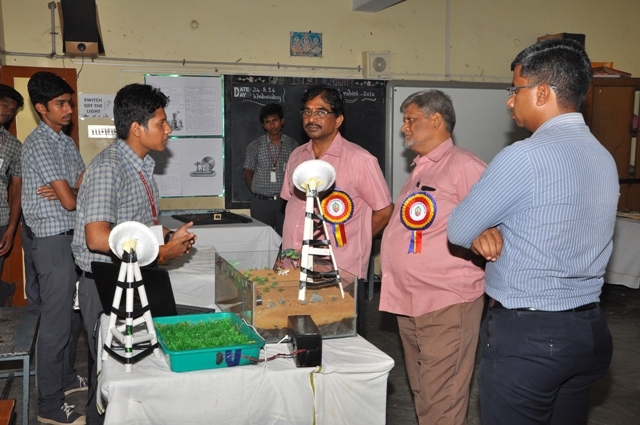 The Judges judged the exhibits and the results were announced during Valedictory function. The winners of the school level competition would take part in State Level Exhibition at our Chromepet (Kishore, Tharun & Teachers) and Chitlapakkam Unit (Sishu & Bala) on 27th August 2016. The first prize winners of this state level will participate in Zonal level at Kerala. 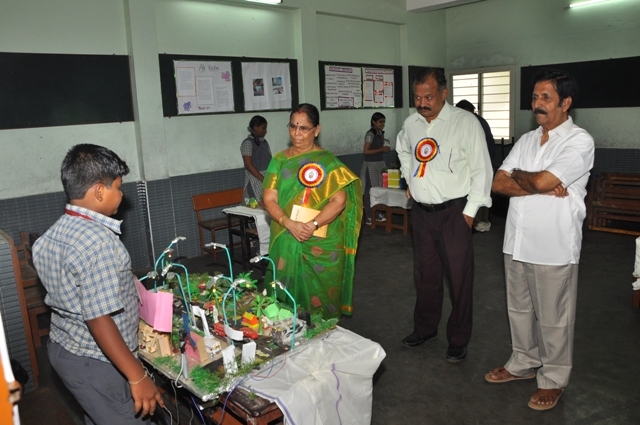 Valedictory function of Vigyana Pradarshini interschool exhibition was held at our school by 3:30pm on the same day. Sri R. Rangarajan ACA, Grad CWA, Ex-IAS Officer, Associate Director, Officers IAS Academy, Chennai presided over the function. Shri. N.R.Narendranathji Honourable Correspondent, Shri. P. Kesavanji Additional Correspondent, and Smt. N.Kalaimani MSC., B.Ed., Principal, Dr. N.K.V.V. Jr. College were on the dias and graced the occasion. Programme started with a prayer to God almighty. Our Hon.Correspondent introduced the guest & welcomed the gathering. Chief Guest Shri. R. Rangarajan was honoured by Shri. P.Kesavanji with a momento as a mark of our respect and gratitude. Presidential Address was rendered by the Chief Guest of the day. The prizes were distributed to the students by Chief Guest Shri. R.Rangarajan, Our Hon. Correspondent, Hon. Additional Correspondent and our Madam Principal. Totally around 270 prizes were distributed. First prize 90, Second Prize 90 and third Prize 90. After the prize distribution the programme concluded with Santhi Manthram.